Here's some guest photos from the Cycle Chic Universe. Firstly, a birthday greeting from our friends at Hungarian Cycle Chic in Budapest. Thanks so much! CPH loves BP, too! 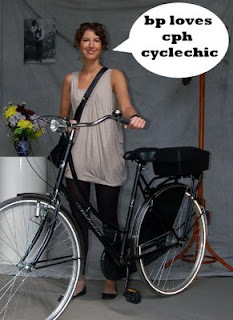 Another Cycle Chic website has appeared, this one in Bucharest, Romania. Thanks to Sorina, a journalist in Bucharest, for sending us these photos from the new blog that she started with some friends. It's called Portocala Mecanica - which means 'Clockwork Orange' in Romanian. "Although this is not a very bike friendly city, I must say cycling is a very important part of my every day life, and it certainly makes it better. I am writing to you because Copenhagencyclechic is one of the reasons I changed by approach on cycling, and, more than that, it is one of the reasons me and two of my friends decided to start our own cycle blog about cyclists in Bucharest and Romania. Although we are just starting up, we are really enthusiatic (obsessed, others say) about it :)"
Wonderful, Sorina! Thanks so much for letting us know. We look forward to more Cycle Chic from Romania! 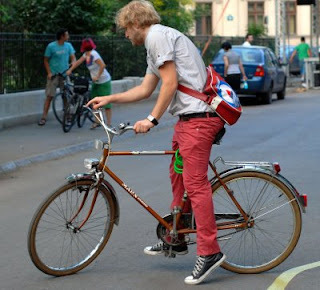 Cycle Chic for Gents in Bucharest. The Cycle Chic empire continues to grow, with others hopping on the Copenhagen bandwagon. Our radar has picked up some other newbies Stateside called Phoenix Cycle Chic and Los Angeles Cycle Chic. Check them out! Thank you for the link to my new blog! Like Hungarian Cycle Chic, I was inspired by your blog to create one for Phoenix. We are historically a very car-centric city but have a dedicated downtown core that is driving change to a more pedestrian and cycle friendly community. We look to you and other cycling capitals for ideas and encouragement. Thank you for what you do!! I'm excited my hometown of Bucharest has its own cyclechic! And I happen to know the gentleman in the photo... lovely treat!